Grilling Vegan Style by John Schlimm. Publisher: Da Capo Press (May 15, 2012). Cooking. Paperback. 240 pages. 978-0738215723. When people [including me] think grilling, they think about throwing meat on a grill, charring it and throwing it on a bun. 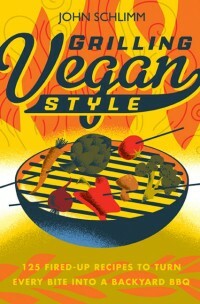 When Grilling Vegan Style arrived in the mail, the mouth-watering, creative recipes instantly delighted me. Fruit and veggies and seitan on the grill. Delicious! Now I need to buy a grill. The lovely, appetizing food pictures make this cookery book one you just might put on your coffee table. Mouth-watering items such as pasta salad with grilled summer vegetables, Italian Herb burgers on Focaccia, Mexican Tortilla Burger and Maple-Soy Tempeh over rice. Then there are drinks like Sassy Sangria, Mojito Mojo and Sweet Tea. For dessert there’s Grilled Peaches with Raspberry Sauce, Fruity Kebabs Brushed with Brown Sugar, Cinnamon and Mint as well as Grilled Pineapple Rings with Sorbet. Of course there are plenty of marinades and delicious sauces. There’s something for everyone’s palate in this cookbook. It’s organized quite well with sections that include: The Basics of Firing Up; Flame Meets Tofu, Seitan, Tempeh and more; Backyard Bites; Summertime Salads; Fired-Up Sides; Tapas on the Deck; Country Marinades for Tofu, Tempeh & Seitan; The Burgers are Ready; New Tailgating Classics; Supper Under the Stars; Picnic Desserts; Grillside Happy Hour. The index organizes by recipes as well as food items. So you can find nearly everything you’d like. Not only is author John Schlimm a member of one of the oldest brewing companies in the United States, he holds a master’s degree from Harvard. The Lean by Kathy Freston. Publisher: Weinstein Books (March 2012). Health/nutrition. Hardcover. 352 pages. 978-1602861732. I have a girl crush on Kathy Freston. She’s a smart, beautiful vegan so it’s relatively easy. 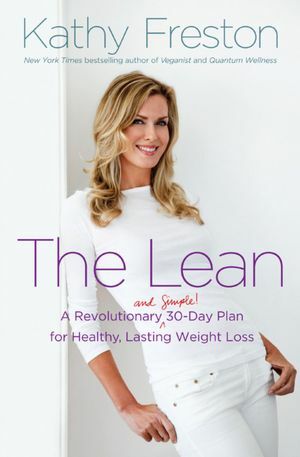 Her latest book, The Lean, provides a 30-Day plan for anyone to ease into better nutritional and a healthy lifestyle. This is all about a plant-based diet. A vegan diet. There’s nothing scary about it and Freston doesn’t shock anyone into it. By providing an assignment each day, the reader can see how s/he feels after doing whatever Freston suggests. Some are easy—drink eight glasses of water, eat a hearty breakfast, eat an apple each day—and some aren’t that easy for some people—eat a meatless lunch, add flax, swap out milk for non-dairy version, reduce/eliminate sugar. Freston provides ample suggestions and encouragement throughout The Lean. She includes delicious recipes to make it much simpler to follow this plan. The Lean reveals a plethora of facts about various foods [one apple gives you an average of 4.4 grams of fiber], how food works in our systems and where food comes from. The appendix contains suggestions on what to keep in the pantry to keeping costs down to a list of resources. I consider myself 90% vegan. An ongoing struggle involves eliminating sugar. I use cane sugar and sometimes agave and sometimes Stevia but it’s not good enough and I know it. But I’m aware of it and working on it. I will also eat small amounts of cheese if I’m out somewhere and it’s on a salad. Freston’s goal is to change our thinking and our relationship toward food. She wants us to feel better and be energetic and healthy by consuming a plant-based diet. It’s such a great book. Everyone needs to read The Lean. 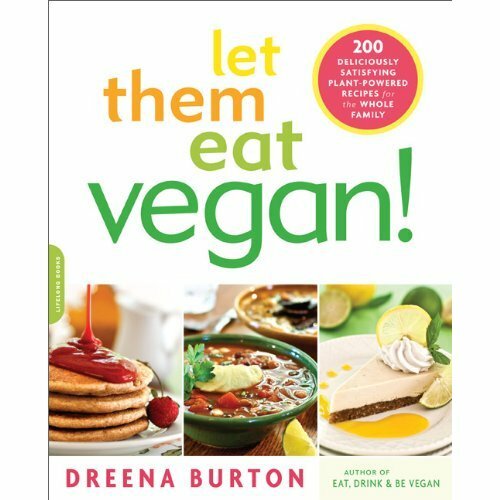 cookbook review: Let Them Eat Vegan! Let Them Eat Vegan! by Dreena Burton. Publisher: Da Capo (March 2012). Cookbook. Health/Diet. 288 pages. 978-0738215617. User-friendly, family friendly positive cookbook with recipes that should appeal to all age ranges and varied palates. Pretty straightforward recipes. She includes “Kid Friendly” and “Adult Minded” tips on certain recipes to make them more appealing for whomever you’re serving. As Dreena Burton is a stay-at-home-mom of several children there are lots of recipes that appeal to kids. “Cheesy” things. Finger foods. Bonus for an entire section devoted to veggie burgers. The negative: I don’t have a lot of the necessary ingredients on hand. My go-to cookbook VEGANIMICON tends to use ingredients in its recipes which I have or can get pretty easily. Something like chia seeds or agar powder isn’t found at the grocery store. I made Boulangerie beans and potatoes. White beans with thinly sliced potatoes layered on top, covered with vegetable broth (I used butternut squash soup because I had some around I wanted to use). It’s a different way to make potatoes. Yummy. I’ll definitely try tapioca pudding, Quinoa Nicoise salad, “No-fu Love Loaf,” Mediterranean Bean Burgers, Wonder Bean Puree and White Bean Sweet Potato Pasta Sauce. 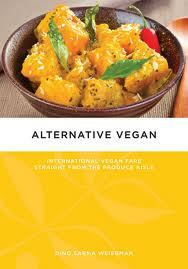 Alternative Vegan, by Dino Weierman. Publisher: PM Press (2012). “Veganism is not a diet. . . It’s understanding that your “choice” to use animals means that you deny the animals’ choice in their own lives. I made some Simple Spiced Cauliflower. Curry. Yummy. New way to prep cauliflower. The potato rounds are super simple too. Will make the more difficult biryani and try the Quick Chickpea Soup. Usually I don’t follow a recipe to make a salad but often I copy something I ate in a restaurant [the Mediterranean salad from John Harvard’s Brew House or the Waldorf salad from Not Your Average Joe’s for example]. His Palm Hearts salad sounds quite delicious and I intend to make it soon. 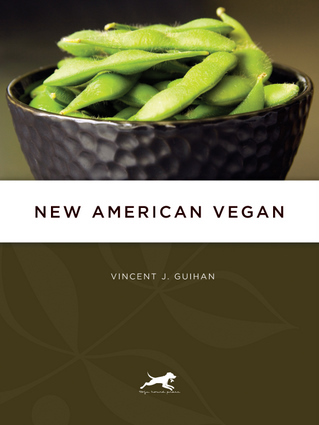 New American Vegan , by Vincent J. Guihan. Publisher: PM Press (2011). Vegan cookbook. Paperback, 225 pg. New American Vegan opens with a very thoughtful and thorough introduction on being vegan and why author Vincent Guihan went vegan. Guihan has chapters on techniques and tools; soup; sauces; side dishes; sietan & potatoes; desserts. There’s an excellent index at the back of the cookbook. There is the Best lentil soup recipe EVER—Old-Fashioned Hearty Lentil & Vegetable Soup—I will make this again and again. I’ll also make the Mango Chili with Tahini Cheese & Cilantro as well as the Stick-to-Your-Ribs Yellow Split Pea & Greens soup. Obviously I like to make soup. Guihan devotes an entire chapter on sauces. “Sauces and dressings are prominent in many cuisines. They both add high points of flavor and color to a dish.” He claims that every vegan has/uses a lot of sauces. Well, not this vegan. I use salad dressing, salsa and stir fry sauce. That’s it. I don’t put sauce on everything I consume. Guess I’m more of a no-frills vegan. I like the taste of most veggies, grains and fruits as it. Maybe a touch of spices. The recipes are just a bit too wordy for me. Plenty of soup recipes in this cookbook which is a great thing. Many recipes needed too many ingredients or called for something I didn’t have in my pantry. With Veganimicon and The Moosewood Cookbook, I don’t think I’d be grabbing this one too often. 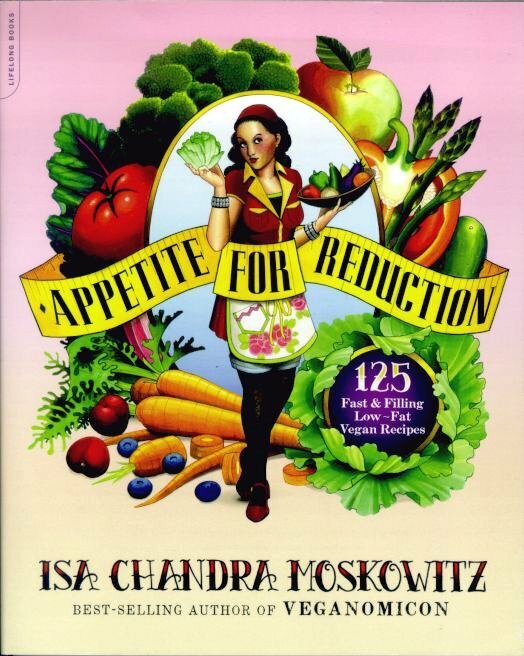 Appetite for Reduction , by Isa Chandra Moskowitz. Publisher: Da Capo Press/ Lifelong Books (January 2012). Cooking/Diet. Paperback, 290 pg. I love Isa. I use Vegan with a Vengeance and Veganimicon all the time. I follow her on twitter and read the recipes she posts on her website Post-Punk Kitchen. When I heard she’d written Appetite for Reduction, I knew I’d want to make some of the recipes part of my vegan diet. The cookbook contains 125 low-fat vegan recipes—salads, soups, chili & stews, veggies, side dishes, pasta, beans, tofu & tempeh. In using any of Isa’s cookbooks, I feel like she’s right by my side as I chop veggies or make soup. Appetite for Reduction features conversational language, side bar tips [cooking/shopping/basic food information], nutritional guides, nutritional tips and simple yet tasty recipes. I’m looking forward to trying many recipes in Appetite for Reduction. Caulipots—a super yummy, quick and nutritious half-half cauliflower-potato mash. glorious comfort food without feeling to full or guilty. Chili-Lime-Rubbed Tofu—relatively easy. Very tasty. I’ve actually never baked tofu. I just buy it at Whole Foods. So this is good. Perhaps a bit too much lime juice tangy when I expected more chili burn. Forks Over Knives is one of the most effective documentaries about going vegan that I’ve seen [better than Food Inc. and Fat, Sick and Nearly Dead]. It provided me with more arguments to use when someone wonders why I’m a vegan and if I’m truly getting all the proper nutrients etc. Yes I am. I feel better than I would if eating dairy or fish and I’ve not eaten meat since I was 18. 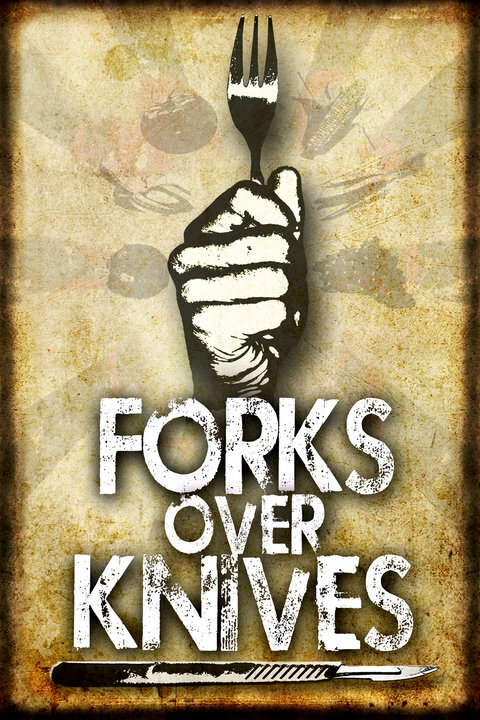 Forks Over Knifes shows how doctors made a link between some of the most serious chronic conditions [diabetes, high cholesterol, heart disease] and the consumption of a whole foods plant-based diet. Some of these conditions get completely reversed by changing one’s eating habits.